Blackhawk DE-ASHT Active Shooter Hallagan Tool FREE SHIPPING! The Blackhawk Active Shooter Hallagan Tool is an essential law enforcement and emergency response tool that provides rapid forcible entry into buildings and vehicles. 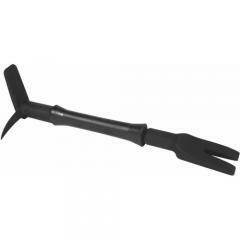 One end features a non-sparking fork designed for safety in hazardous areas. The other end is made from stainless steel and built for high-impact tasks. The large wedge features friction ridges that increase leverage for breaching reinforced doors, like the ones found in government offices and school buildings. It also includes a sharp horn that provides extreme penetrating power when swung. The safety-conscious handle design is electrically non-conductive to 100,000 volts, as well as self-extinguishing. It is shaped to encourage proper hand placement and provide a secure grip. ©2002-2019 CopsPlus.com: Blackhawk DE-ASHT Active Shooter Hallagan Tool FREE SHIPPING!